Well.... August hasn't really turned into the hot and sunny month we are (kind of) used to has it? As I sit here writing this I'm looking out the window to a seriously grey and soggy looking England - booooo! When I have a day off work and it's raining I'm not going to lie.... I kind of love it! It's always a fab excuse to have some 'me' time and chill out by doing some of my favourite things - yes call me lazy if you want too but sometimes you just need to have a good relaxation session! TV show marathons, favourite movies or just catching up - there's nothing more relaxing for me than being in comfortable clothing (aka pjs and a huge sweater), with a blanket on my sofa with a nice cup of tea watching some good old TV! My favourite shows at the moment have to be : Total Divas, Devious Maids, Little Women NY, Dance Moms, Catfish & UnReal! And my favourite movies to watch on a rainy day are : The Help, Love Rosie, Just Go With It, Harry Potter & Beauty & The Beast. Whether it's book, magazines or blogs, something else I love to do is relax, listening to the rain hitting the windows and delve into something good to read! I'm currently reading Holly Madison's biography (which is bloody brilliant!) and my favourite mags are Glamour, Cosmo & heat! Guilty!!! I'm a sucker for grabbing my phone/ipad/laptop having a browse online, making a shopping list/wishlist if it's before payday or having a spend up if it's after! My go-to website for clothing is ASOS. The ASOS sale literally rules my life - I think I look through it daily..... but it's just so so good! When it's raining outside and the thought of venturing out is just a resounding NO then I find I'm so easily motivated to organise my life! Everything from clothing to my make-up storage, there's something so satisfying about clearing things out and giving things a make-over! I love a good wardrobe clearout and I'm currently adding lots and lots to my eBay! Goodbye clutter hello pennies! YES! You girls must all agree with me! If you aren't planning on heading out at all for the day then what's better than getting out your favourite treatments and treats to give yourself a full on overhaul. Facemasks, hair masks, shaving, fake tanning, pedicures, nail painting - the works! Being a girl is THE best! 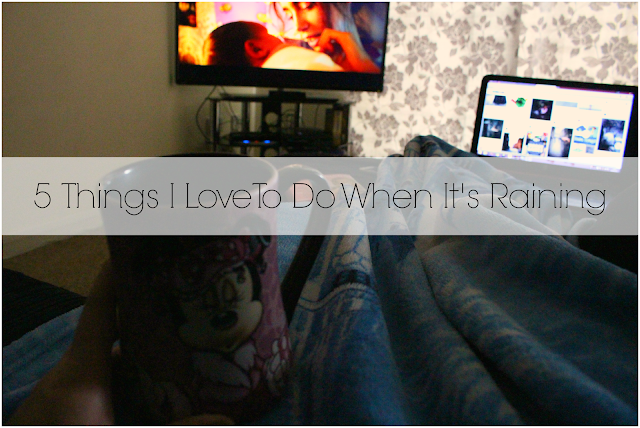 What are your favourite things to do when the weather is horrendous? I do love rainy days when I don't have to be anywhere. I always light loads and loads of candles and get all cosy. It does get a bit annoying when you have to go somewhere and end up soaked! I'm always online window shopping! I prefer rainy days indoors too! Online window shopping is one of my favourite hobbies! I did a post on the bottomless vortex that is the ASOS sale, it is endless! I agree Devious Maids is such a fun show, reminds me so much of Desperate Housewives! Netflix and snacks were made for rainy days! Binging on. Bad food like chilli sensations and chocolate And watching ghost adventures!! I love rainy days because you can do things like this. I also find the sound of rain on the roof really relaxing. I agree with everything you put, you cannot have a proper rain day without a bit of pampering and film watching. Watching crappy TV is a onesie with chocolate is my plan. I do all of these too, especially the life reorganisation - I love a sort through my wardrobe!